This past weekend was the OMA Winter National round at Coal Creek. The OMA has a well deserved reputation of brutal courses geared towards the advanced rider. While I could, and did, ride everything (evening winning last year’s race) this style is just not what I want to race. I was happy that I have enough skill to clean every obstacle. However I just hated racing it, so I pulled out half way after 3 laps. When I arrived I saw that an endurocross course had been added to Coal Creek’s event area and it was flagged for us to race. I immediately knew I was going to struggle. I heard a saying that usually suits me. It says something along the lines of ‘I hit it fast enough and it usually buffs out’. But the slow technical stuff really gives me fits. When I got to the endurcross section I was stressing. I actually made everything pretty clean with the exception of the earthmover sized tires laying flat on the ground. It looked like a Keystone Cops comedy sketch. There were bikes and bodies everywhere. 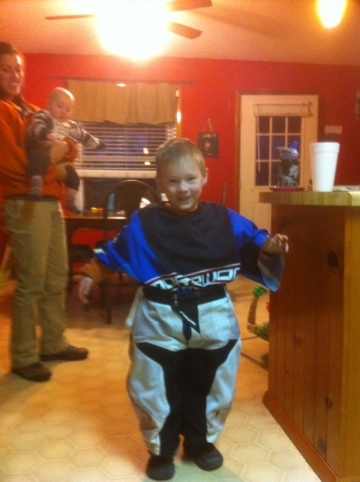 Trying to maneuver a 230 lb dirt bike with moto boots is tough enough in good conditions. But trying to teeder on top of a muddy, greasy tractor tire was just impossible. I never made it through clean and by the third lap it was removed and bypassed. I think I’ll stick to the more open, true to style hare scrambles. 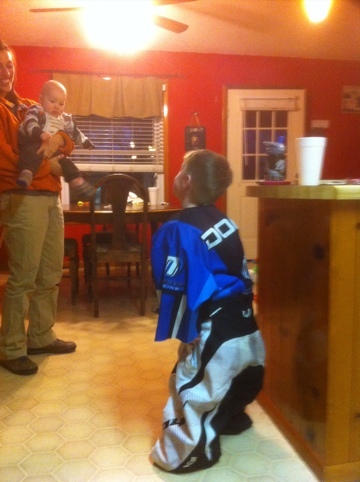 Anyway while Wyatt and I were in the shop getting my bike ready for the race Friday night, he found my bike gear and had to put it on. I nominate this post for greatest post of the blog. Little man is awesome!